Detailing the physical features, habits, territorial reach and other identifying qualities of the Blue-Eyed Darner. The striking Blue-Eyed Darner is one of the earliest Darners to make an appearance in Spring west of the Rockies. 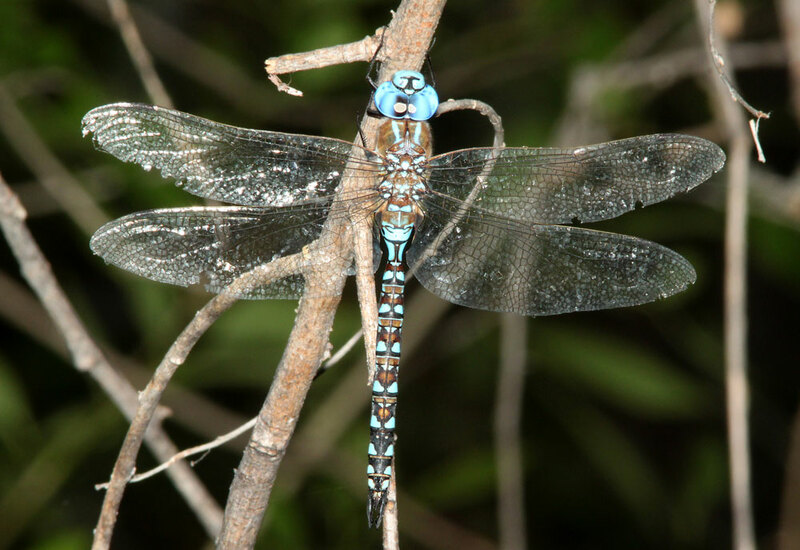 Thanks to their large size and beautiful blue eyes, the Blue-Eyed Darner is easy to spot and identify. The blue and black coloring on the abdomen ('tail') is difficult to miss. This species is one of a few Darners to make an appearance soon after winter in the western part of the continent. It is abundant in its habitat and range, and populations may venture even further south than Mexico. Males have large chalky blue eyes that are the same color on their abdomen. They also have some silver gray on their bodies. Females do not have blue eyes and are yellow-green in the areas that are blue on males. Both sexes can measure longer than 5 cm (2 inches), but wingspan is closer to 10 cm (4 inches). Wings are transparent. The abdomen has a repetitive pattern of white small white triangles, red-brown circles and blue triangles on each segment. The tip of the abdomen forks. While darners are disinterested in humans, if handled they may bite. Their jaws are large enough for a human to feel a pinch if bitten. Darners mate in flight. A males places a sperm packet on his abdomen and, once joined in flight, a female will pick it up off of him and use it to fertilize her eggs, which she has attached to vegetation near water. Females then place fertilized eggs in warm, slow moving waters like ponds, swamps, creeks and small streams. Once hatched, the naiads live in the water, feeding on small aquatic insects, tadpoles and even small fish if they are able to catch them. After a few years, once the naiad is fully grown, it crawls out of the water (usually at night) and sheds its 'skin', molting into a winged adult, and flies away.